Unicorns are *very* philosophical. Really. Contrary to popular belief, the middle ages were not a time of mass illiteracy where ignorant folk ran around covered in filth burning duck-weight witches. I’d suggest a bit of Got Medieval to correct that view (as well as filling your head with tidbits of what monkeys do in the margins of manuscripts) if you don’t already believe everything was Right With the World before Luther/Descartes went and messed it up. The other important notion to disabuse yourself of is that copying was done by monks. Well, okay. There were monks who copied, illustrated, illuminated, and bound books, but equating medieval bookmaking with monks is like equating Belgian beermaking with Trappists. Sure, there are Trappists in Belgium who make really good beer, but not all (or even that many) Belgian brewers are Cistercians of the Strict Observance. Most are folks living in the world practicing a trade—which is what most people involved in the various aspects of book arts did in the middle ages as well. Of course, this is where it gets complicated. See, nowadays we expect to buy a book—say, David Foster Wallace’s The Broom of the System—complete, printed, bound, and delivered. That’s not at all how it worked back then. Instead, a well-off student would purchase various unbound written materials from scribes—usually about the length of a novella, short epic poem, or chapter of a learned treatise—take these sections to an illustrator or illuminator if appropriate, then have them all bound together. Thus, rather than buying all of Broom of the System, I’d buy the first several chapters of it, the section of Ronald Dworkin’s Justice for Hedgehogs that deals with interpretation, all of Pamela Vandiver’s articles on inlay techniques in Korean celadon wares, and bind them all together with a few articles from the latest edition of Noûs. Of course, if I weren’t so well-off, I’d go to the library (or, back in the day, the store that rented out authorized copies of course materials), copy out and take notes on whatever I wanted to read, and stuff everything into a folder somewhere. This presents a problem for medievalists when it’s the only copy of some text or other, but . . . 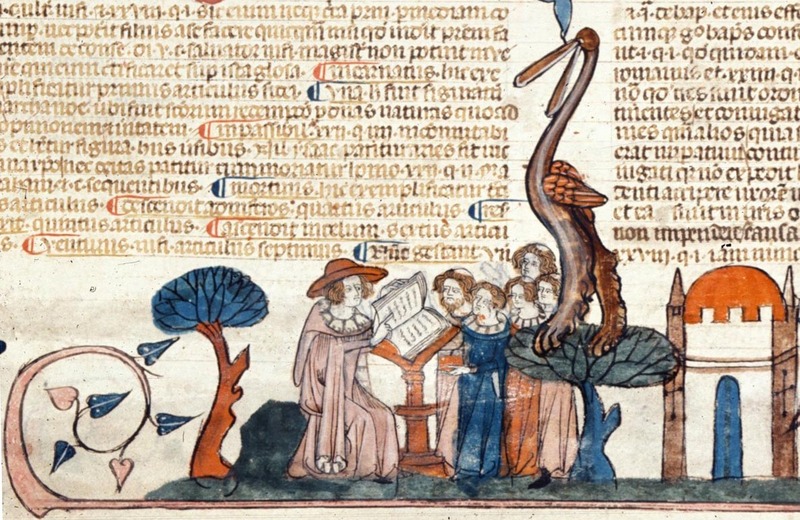 The only thing weird about medieval reading was the strange birds watching you. Anyway, ebooks. If you can buy books by the chapter—just as you can buy music by the song—then it seems as if you should be able to create “personal books” based on the particular texts and editions you wanted, in addition to catering to rather odd reading habits. Though I suspect this may work better for collections of stories, serials, and academic books than it would for novels—after all, having your book stall out halfway through the plot isn’t much fun—there is something to be said for having The Book You Really Needed for the Project You’re Working On. For instance, I’m working on a project showing how interpretive and semantic theories of law can be explained by reference to Wittgensteinian rule-following and Eco-style interpretation. Of course, I only need a few chapters from each book I work with—part of Justice for Hedgehogs, a single chapter of Eco’s The Limits of Interpretation—you know, “Intentio Lectoris: the State of the Art”—a few chapters from the books that have already been written about viewing law as a rule-guided linguistic activity . . . Done this way, I have the book I really need, organized according to which parts I’ll need for each section of my argument, completely searchable, and all bound up in one handy volume. Heck, if I were feeling really ambitious, I could even throw in the Yves Klein and Paul Delvaux paintings I reference in describing how the form of interpretation Dworkin bases his argument on is a rule-guided activity. Now that I think about it, I could even pass you my Special Ebook with my paper attached—a record of all the documents I used with my commentary added. Which, for reasons I’ll get into in my next post, is even more medieval than just putting together segments of books. Suffice it to say for the time being that notes scribbled in the margins sometimes turn out to be very important indeed. This entry was tagged dworkin, ebooks, everything old is new again, hart, medievalism, personal projects, umberto eco, wittgenstein. Bookmark the permalink. An interesting idea – I know Oxford Scholarship Online do this already, I find it very handy for grabbing chapters when I don’t need the whole book. I’m benefitting from being part of an institution at the moment. But I’d certainly go for some kind of subscription service (say Netflix for non-fiction) where you pay a flat fee and can download x chapters/journal articles a month. I guess the problem would be covering a big enough range of publishers. And publishers might bridle at the possibility of subscribers passing on articles etc (which people do now anyway). But my instinct is that if such a subscription system was seamless enough, people would pay for it rather try to get bootleg copies. For example, the system could include a built-in citation manager (ideally one that actually worked), so your own publications could include a web page of the works you cited.